Looking at the amount of stuff lying on the floor around the kayaks in dry bags, we did begin to wonder if we had brought too much stuff and how it would all fit in, to be fair to us though we did only have one hold bag between the two of us! 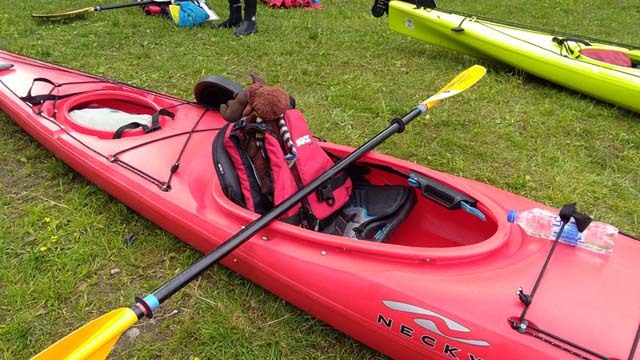 But with a small amount of squashing and strategic placing of items into the deceptively spacious kayaks, we managed to get all our belongings and camping equipment in with a bit of room to spare! 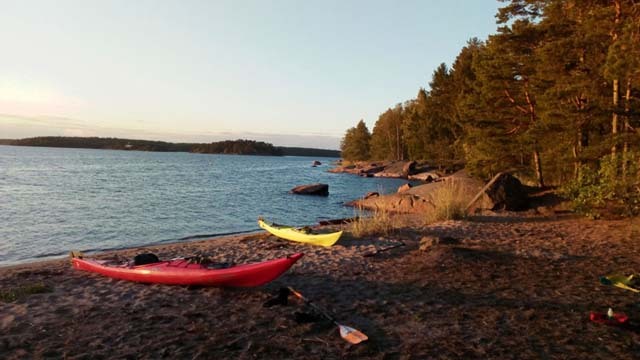 Getting ready for a paddle adventure in the Stockholm Archipelago: Photo: Niki Nature Travels. As we were to be celebrating midsummer with Sofia and Bob on an island not too far from the kayak centre, we had two days to spend kayaking and exploring the nearby islands at a laid-back pace. Almost ready to begin! Photo: Jayne Nature Travels. We had been told about an island which had an almost entirely enclosed bay so the water was shallow and should be warm enough for swimming, this we thought would be an ideal place to spend our first night, especially as this island had a wilderness toilet and several water pumps on it. 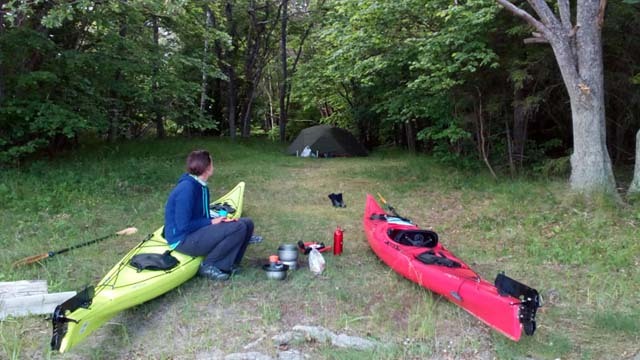 The Right of Public Access offers the wonderful freedom to camp wild during your tour. Photo: Jayne Nature Travels. The journey to the island wouldn’t take too long if we were to go directly there so we decided to take a detour to make our journey a little longer. That evening after a “hard day in the office” we were treated to a beautiful sunset as we relaxed at our camp feeling that we were the only people in the archipelago! 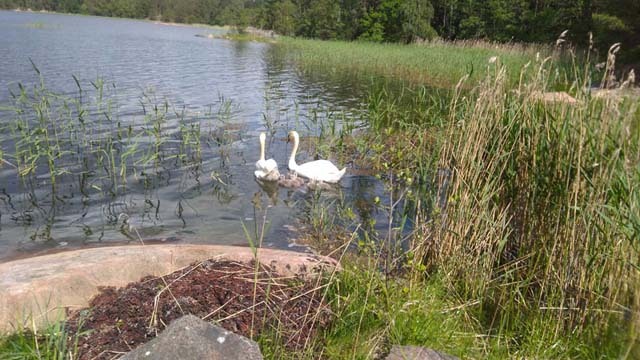 Archipelago wildlife includes swans but also the majestic White-tailed Sea Eagle. Photo: Jayne Nature Travels. The next day after a leisurely morning soaking up the sun and watching a family of swans, who were our only companions on our inlet, we took a walk through the woods in search of the water pump. As we were travelling around Midsummer (one of the busiest times of the year in the Archipelago) we soon came across some sailing boats moored in one of the bays, where there was a water pump and some dry wilderness toilets. Here we met a man who was gathering birch branches to cover the front of his boat, which is one of the many Midsummer traditions. With the day’s kayaking finished, it’s time to enjoy the evening ashore. Photo: Jayne Nature Travels. The journey to our second night’s island was a short paddle away, but as there were others travelling to their islands for the Midsummer celebrations, we did have to wait a while to allow the faster moving sail boats and motor boats to pass before making certain crossings between islands. We were camping next to a lovely little beach and despite the fact that here were houses on the other side of the island and the occasional boat passing, it felt quite secluded. 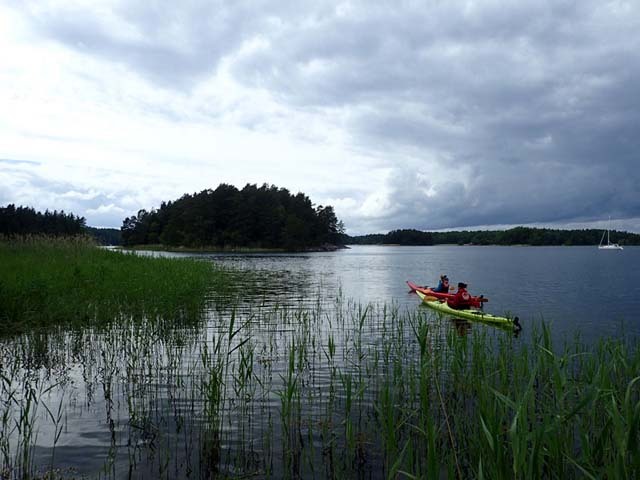 After a sunny morning’s paddle we arrived at the island where we would spend Midsummer. 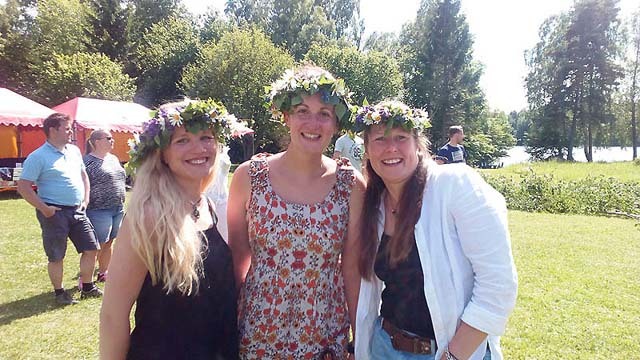 The day was then spent making flower garlands for our hair and the Midsummer bough, eating, singing, dancing, more eating and generally enjoying ourselves! Making our own Midsummer “flower crowns”! Jayne, Niki and Sofia from the Nature Travels team. Photo: Nature Travels. However, once at our evening camping spot, which was one an island about an hour’s paddle away from the kayak centre and was quite close to the mainland, we did start to notice that there were more people around and a few people did walk past our campsite throughout the evening (as we discovered on our paddle back to the kayak centre, this was because there was a boat club on the other side of the island). Our campsite had proper fireplaces and a lovely beach where we could watch the world go by. Paddling the next day after eating nearly our own bodyweight in cake and tasty food was hard work, especially as the wind was blowing towards us! So we were very glad that we didn’t have far to go and that everyone else seemed to be staying on their islands so we had the whole of the waters to ourselves. 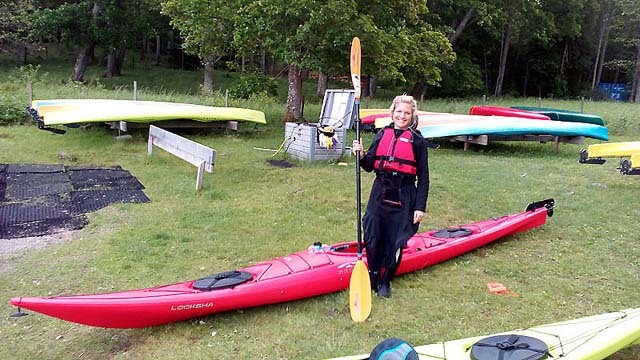 Jayne and Niki set sail from the Midsummer party island to return to the kayak centre! Photo: Nature Travels. On our return to the kayak centre we set about cleaning our kayaks inside and out using the pressure washer and water vacuum cleaner provided, which actually turned out to be quite fun to use! Once we had sorted our belongings back into our hold bag, we said our goodbyes and set off on the 2km walk to the bus stop. 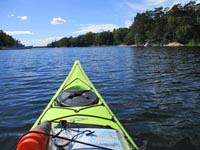 If you would like to go on your own kayaking adventure, Stockholm Archipelago Self-guided Kayak Explorer is offered between the beginning of May and late September.